Son of War, Daughter of Chaos was another great story that I thoroughly enjoyed from Janette Rallison. I loved the mix of myth, legend, history, and fantasy. I also loved the adventure, romance, peril, and suspense. I have found that for me to love a story, I must connect to, understand, and love its main characters. Aislynn was great! I liked how she had such an intense desire to learn, how she had suffered loss, was loyal, strong, and willing to make sacrifices for what she believed was right. I also really liked her family, even though I wanted them to be much more open with her. I liked Jack with his charm and protectiveness. I loved Dane, especially as he tried to figure things out, specifically Aislynn. There was some fabulous dialogue full of wit and sarcasm that had me smiling and laughing. There were also some sweet kisses that made me sigh. There was quite a bit of subterfuge and betrayal in this story. There was also loyalty, friendship, and love. I enjoyed these characters and liked that there was romance, but it didn't overshadow the plot. The relationships developed over time, from acquaintances, to friends, to the possibility of something more, so no instant-love. I enjoyed how each aspect of the story and its characters all fit together. The story was constantly moving and evolving, keeping me guessing at the truth and what would happen in the end. I'm not sure what will happen in the following book and if Aislynn's plan will work. I'm sure there is still much danger lurking ahead for her. 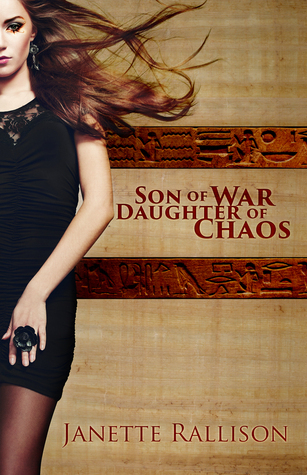 If you enjoy reading urban fantasy, action and adventure, Egyptian myths, and about characters fighting against insurmountable odds, then I would recommend Son of War, Daughter of Chaos. I can't wait to find out what the next chapter in Aislynn's story will be! I'm new to the Heir Chronicles. I don't know how I missed it. I love magic reads. SWAY sounds like a solid read. Sounds like you found a winner. Don't you love it when the characters just click! This sounds really good and I'll add it to my summer reading list. Thanks for your review! This is the first I hear of these books but I will definetly check them out. It will be the third book I will have read from her. They straight Adult Romance, but cleaner. I just love her books!! I've read all the books in this series except this one and book 4, so I'll be reading them together. Do! They should be good! I do. I liked that the author did so well letting the MC feel torn between these two factions or sides. Hopefully there will be a second book.